*GymRealm was founded in 2011 as a typical startup in a garage with the goal to change the life of gym owners. Soon the first happy customers came. 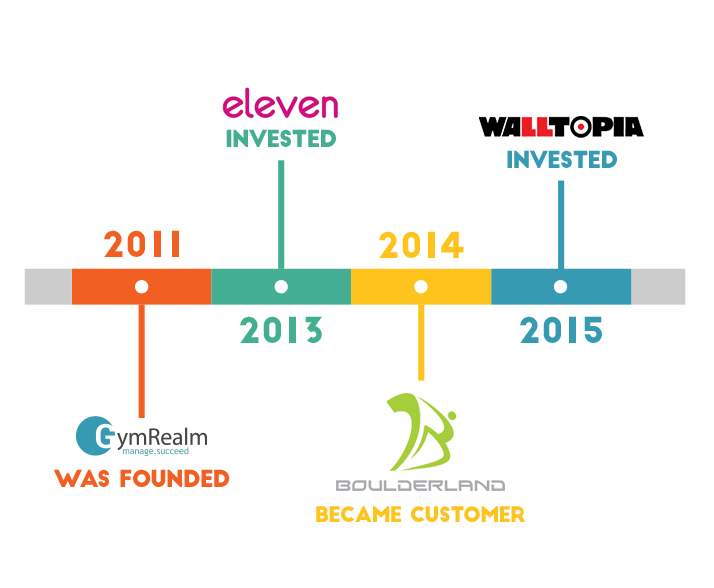 *In 2013 Eleven accelerator venture fund invested in Gym Realm to push it further. *2014 Walltopia (world’s leading climbing wall manufacturer) became customer of Gym Realm Manager. Adventure Facility Concepts & Management is a company that specializes in management, operation and consulting sports and family entertainment centers. They developinnovative solutions for day-to-day operations and processes to provide highest customer satisfaction rate and long-term profitability. Founded in 1966 by Pierre Bellon in Marseilles, France, Sodexo is now the worldwide leader in Quality of Life services. Sodexo is the only company to integrate a complete offer of innovative services, based on over 100 professions. They develop, manage and deliver a unique array of On-site Services, Benefits & Rewards Services and Personal and Home Services. Microsoft Corporation is an American multinational technology company headquartered in Redmond, Washington, that develops, manufactures, licenses, supports and sells computer software, consumer electronics and personal computers and services. Its best known software products are the Microsoft Windows line of operating systems, Microsoft Office office suite, and Internet Explorer and Edge web browsers.